The city of Tomsk in western Siberia has earned itself the title of Russia's major education and IT hub, and one of the country's fastest-developing innovation-based centers. Some of the region’s main industries are machine building, metal working and timber – but as important are nuclear research and production. However, now investment is flowing into new and growing industries that include technological innovations, scientific research and development. 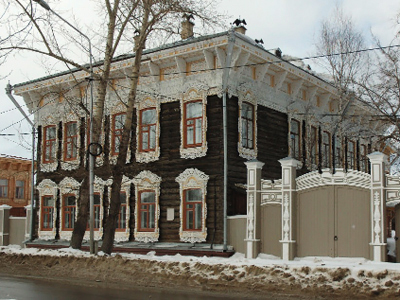 Tomsk is one of the oldest cities in Siberia, but it was only officially opened to foreigners in 1990. Today, wooden houses which are hundreds of years old still line the streets. These are contrasted by the youthful enthusiasm of students who flock to Tomsk, the home of Siberia's first university. Artyom Kokorin is a graduate of the Tomsk Polytechnic University. He is only 24, but he is already working on a PhD and is running his own welding company, with 26 branches all over the country. But in the world of business, a great idea needs money to get off the ground. And that's where venture capitalists like Nikolay Batulin come in. “My business motto is ‘If not me, then who?’ I was looking for different ways I could invest and I found something that I thought was best – investing in innovation, creating new products, new technology,” says Nikolay Batulin from the Fibra Innovation managing company. One of the many businesses Batulin invested in is a water purifying method. It is still in the testing stage, but he believes in its potential. “At first the main goal was to filter out viruses, but now we are more concerned with heavy metals – arsenic, in particular,” Batulin says. Batulin has another project up his sleeve – a new piece of technology that may be able to assist in the battle against cancer. Businessmen say one of the main advantages of having a base in Tomsk is the abundance of great minds. Universities line the main street in the city center, and one in every six people is pursuing some form of education. The RT team were told that in the city of Tomsk, it is cool to be an intellectual. Chekhov's unfavorable comments earned him a mocking statue in Tomsk – an amusing reminder that the local people do not take kindly to such remarks. Even from a fellow intellectual.